Joshua D. Warren, DVM, is a neurology and neurosurgery resident at Red Bank Veterinary Hospital in Tinton Falls, New Jersey. He earned his DVM from Purdue University. His clinical interests include CNS tumors and clinical neuroanatomy. Eric N. Glass, DVM, MS, DACVIM (Neurology), is the section head of neurology and neurosurgery at Red Bank Veterinary Hospital in Tinton Falls, New Jersey, and of Compassion-First Pet Hospitals nationwide. Dr. Glass earned his DVM from Cornell University. He completed a rotating internship at the Animal Medical Center in New York City and a residency in neurology and neurosurgery at University of Pennsylvania. Dr. Glass has been published in multiple peer-reviewed journals and is a co-author of the textbook Veterinary Neuroanatomy and Clinical Neurology. His clinical interests include neurosurgery and correlation of neurologic signs with neuroanatomic diagnoses. Rachel Song, VMD, MS, DACVIM (Neurology), is a neurologist and neurosurgeon at Red Bank Veterinary Hospital in Tinton Falls, New Jersey. After completing a rotating internship at Red Bank Veterinary Hospital, she earned her master’s degree and completed a residency in neurology and neurosurgery at The Ohio State University. Dr. Song has authored numerous peer-reviewed journal articles. Marc Kent, DVM, DACVIM (Neurology), is a professor of neurology at University of Georgia. Dr. Kent earned his DVM from Cummings School of Veterinary Medicine at Tufts University and has published many scientific articles. His research interests include a wide array of subjects in clinical neurology and neuropathology. 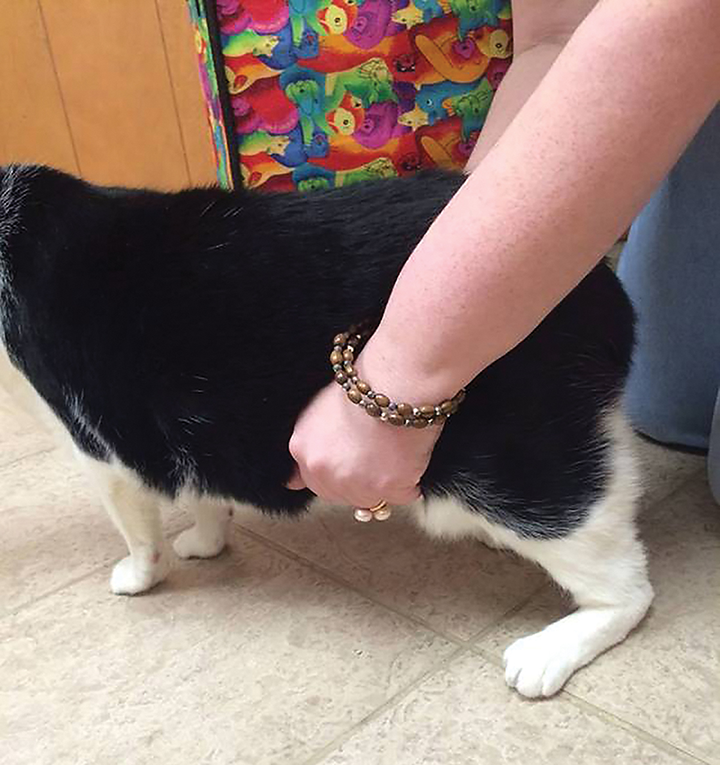 Socks, a 12-year-old, 14.8-lb (6.7-kg), indoor, neutered male domestic shorthair cat, was evaluated for a plantigrade stance in the left pelvic limb (Figure 1) of several days’ duration. Socks had no other known health issues, was current on vaccinations, and had no known trauma. There was a poor withdrawal reflex of the left pelvic limb characterized by an inability to flex the stifle/tarsus, with normal flexion of the coxofemoral joint. Withdrawal reflexes in the thoracic and right pelvic limbs were normal. Patellar reflexes were normal bilaterally. Mentation, cranial nerves, and postural reactions were normal, and hyperpathia was not observed on vertebral column palpation. Abnormal gait was limited to the plantigrade stance in the left pelvic limb. CBC, serum chemistry profile, and 3-view thoracic radiographs were normal. Serology results for FeLV, FIV, coronavirus, Toxoplasma gondii, and Cryptococcus neoformans were negative. MRI of the vertebral column from L5 through the caudal vertebrae and extending through the pelvic limbs revealed enlargement and abnormal homogeneous contrast enhancement of the left sciatic nerve between the biceps femoris and semimembranosus muscles from the level of the greater trochanter distally to the level of the mid-diaphysis of the femur. There was no mass effect. Initial fascicular biopsy and histopathology of the sciatic nerve revealed degenerative changes consisting of axonal loss, adipose infiltration, and fibrosis. There was no evidence of neoplasia or inflammation. After the initial biopsy, Socks was treated palliatively with analgesics and corticosteroids. No change in neurologic function was noted. Despite the initial biopsy results, neoplasia involving the sciatic nerve was considered likely. The owner was instructed to monitor for progression of weakness or development of other neurologic deficits. FIGURE 2 Intraoperative photograph of the patient’s left sciatic nerve mass 28 months after initial presentation. Histopathology was consistent with MNSN. Proximal is toward the top and cranial to the left of the photograph. Twenty-eight months after initial presentation, the neurologic examination was unchanged. However, a palpable mass was present in the left caudal thigh, and there was atrophy of the muscles distal to the stifle. CBC and serum chemistry profile remained unremarkable, but thoracic radiographs revealed a left cranial lung nodule. MRI of the pelvis and left pelvic limb revealed a 3.8 × 4.6 × 7.3 cm, multilobulated, ovoid mass located in the mid-thigh between the biceps femoris and semimembranosus muscles (Figure 2). As compared with the adjacent muscles, the mass was hyperintense on T2-weighted images, was hyperintense on T1-weighted images, and displayed strong, homogenous contrast enhancement. The owner declined definitive therapy (ie, pelvic limb amputation, hemipelvectomy, radiation therapy, chemotherapy) for the mass and elected palliative excisional biopsy of the mass. 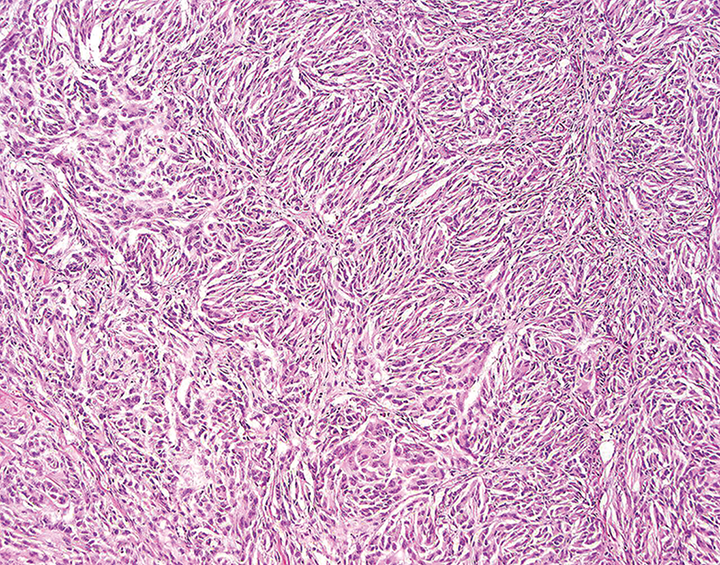 Histopathology following excisional biopsy was consistent with a malignant nerve sheath neoplasm (MNSN; Figure 3). No special stains were performed, as the pathologist was comfortable with the diagnosis of MNSN based on histopathology. Socks was treated postoperatively with analgesics (ie, tramadol [12.5 mg PO q12h], transdermal fentanyl patch [12 μg/hr]), antibiotics (ie, amoxicillin–clavulanic acid [62.5 mg PO q12h]), and corticosteroids (ie, prednisone [5 mg PO q12h]). 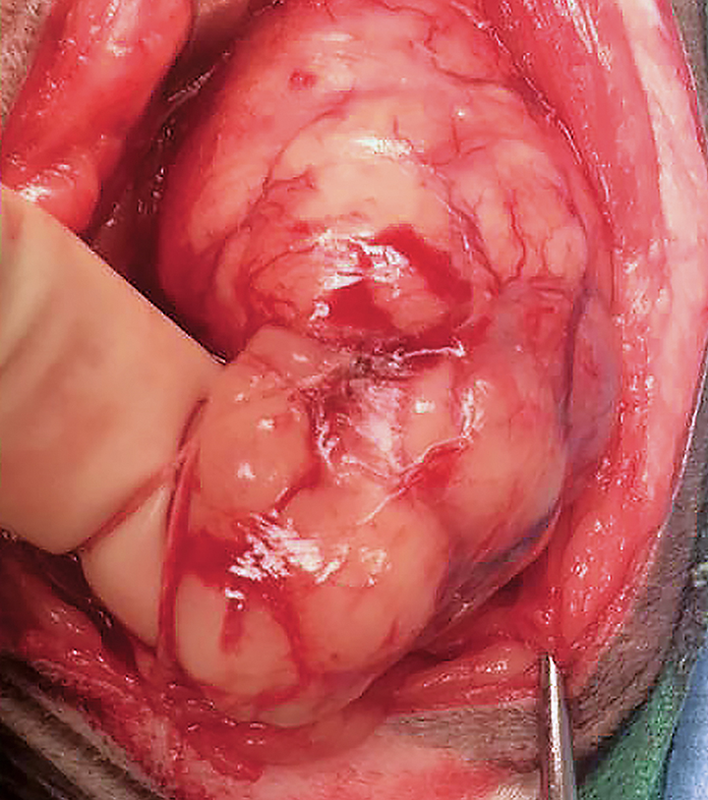 The lung mass was not addressed further because the owner did not wish to pursue further diagnostics or treatment and the nodule was suspected to be a primary pulmonary neoplasm. Excision of the neoplasm provided analgesia, but neurologic status remained unchanged. FIGURE 3 Histopathology of the mass was consistent with MNSN. A characteristic Antoni type A pattern consisting of bipolar spindle cells forming intersecting bundles, streams, and whorls can be seen. Not shown are the necrosis, atypia, and high mitotic rate that were noted in the patient and led to diagnosis of MNSN. Forty-six months after initial presentation, examination revealed a firm, painful mass, measuring approximately 2 to 3 cm, dorsomedial to the left greater trochanter. The left plantigrade stance persisted. Socks had excessive flexion of the left coxofemoral joint during protraction and persistent poor withdrawal reflex. There was progressive atrophy and secondary contracture of the superficial and deep digital flexor and gastrocnemius muscles, resulting in hyperextension of the tarsus and flexion of digits. Left tarsal laxity and crepitus were palpable. Thoracic radiographs revealed enlargement of the left cranial lung nodule. Radiographs of the tarsus revealed osteopenia and proximal intertarsal joint subluxation. MRI of the left pelvic limb revealed regrowth of the mass (1.7 × 2.4 × 3.1 cm) at the level of the coxofemoral joint (Figure 4). Histopathology following excisional biopsy confirmed MNSN. FIGURE 4 Repeat MRI 46 months after initial presentation revealed regrowth of the left sciatic nerve mass. Dorsal plane MRI T1-weighted images (inversion prepared following fast spoiled gradient echo) obtained after intravenous contrast medium administration. Figure 4A is dorsal to the pelvis. The contrast-enhancing enlarged sciatic nerve (solid arrow) that courses to a large mass (open arrow), in addition to the visible colon on the midline (asterisk), can be noted. Figure 4B is at the level of the coxofemoral joints (open arrowheads). 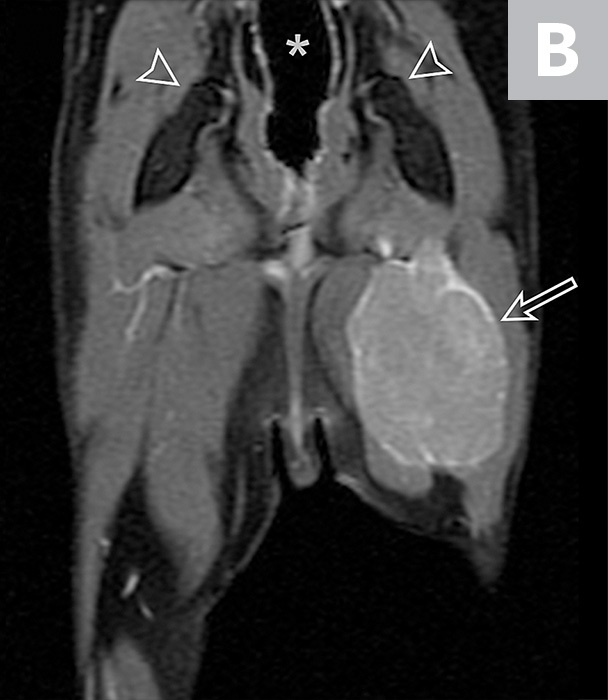 A large, uniformly contrast-enhancing mass can be observed in the mid-thigh (open arrow). The colon is visible (asterisk). After diagnosis of MNSN, the owner again elected palliative excision of the recurrent painful neoplasm with adjunct corticosteroids (ie, prednisone [5 mg PO q12h]), analgesics (ie, tramadol [12.5 mg PO q12h], transdermal fentanyl patch [12 μg/hr]), and antibiotics (ie, amoxicillin–clavulanic acid [62.5 mg PO q12h]). Six months postoperatively, Socks appeared comfortable with static neurologic examination. Tibial nerve dysfunction with denervation of the tarsal extensor muscles (ie, gastrocnemius, superficial digital flexor). Endocrine-related neuropathies can affect the tibial nerve. In cats, diabetes mellitus can cause bilateral tibial nerve paresis/paralysis. In dogs, hypothyroidism may affect the tibial nerves. Resolution of tibial nerve paresis/paralysis may occur with treatment of the underlying endocrinopathy. Partial or complete disruption of the common calcanean tendon. With disruption of the origin of the gastrocnemius muscle, the gastrocnemius muscle itself, or its tendon of insertion, the tarsus overflexes (ie, plantigrade stance) with weightbearing, and there is flexion of the digits. With tarsal flexion, the digits flex due to tension placed on the intact superficial digital flexor tendon as it courses along the caudal surface of the tarsus. In cases involving complete rupture of the calcanean tendon, plantigrade stance will be more complete and the digits normal. Nerve sheath neoplasms typically progress slowly over weeks to months.2 MNSNs are often treated with surgical excision via limb amputation when the neoplasm involves a named nerve of the limb. Despite gross cytoreductive surgery, there is a high risk of recurrence.3 Although rare, pulmonary and regional lymph node metastases have been reported in a cat.4 Median survival times for cats with integumentary nerve sheath tumors with surgery alone has been noted at 645 days.5 The role of postoperative radiation therapy or chemotherapy has not been defined, but they are likely to provide beneficial effects. de Lahunta A, Glass EN, Kent M. Lower motor neuron: spinal nerve, general somatic efferent system. In: de Lahunta A, Glass EN, Kent M. Veterinary Neuroanatomy and Clinical Neurology. 4th ed. St. Louis, MO: Elsevier Saunders; 2015:102-161. Withrow SJ, Vail DM, Page RL. Tumors of the nervous system. In: Withrow SJ, Vail DM, Page RL. Withrow & MacEwen’s Small Animal Clinical Oncology. 5th ed. St. Louis, MO: Elsevier Saunders; 2013:583-596. Schulman FY, Johnson TO, Facemire PR, Fanburg-Smith JC. Feline peripheral nerve sheath tumors: histologic, immunohistochemical, and clinicopathologic correlation (59 tumors in 53 cats). Vet Pathol. 2009;46(6):1166-1180. Buza EL, Menzies RA, Goldschmidt MH, Durham AC. 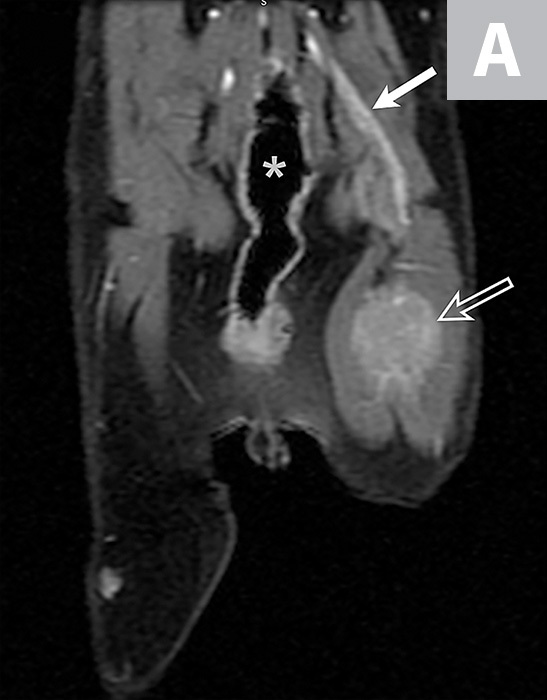 Malignant peripheral nerve sheath tumor in a cat with nodal and pulmonary metastases. J Vet Diagn Invest. 2012;24(4):781-784. Dillon CJ, Mauldin GN, Baer KE. Outcome following surgical removal of nonvisceral soft tissue sarcomas in cats: 42 cases (1992-2000). J Am Vet Med Assoc. 2005;227(12):1955-1957.